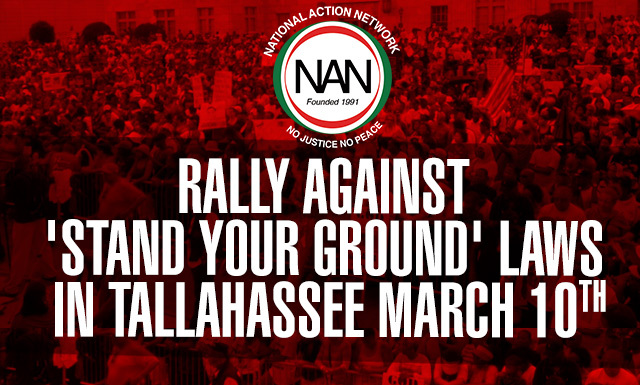 (UPDATED) Reverend Al Sharpton and the National Action Network will be joined by the parents of Trayvon Martin and Jordan Davis, and Attorney Benjamin Crump as they lead a march through Tallahassee on March 10th calling for a repeal of “Stand Your Ground’ laws in Florida. Participants are asked to arrive by 9:00 a.m. for the march, which starts at 9:30 a.m. from the Tallahassee Leon County Civic Center, 505 W. Pensacola St., and ends at the State Capitol at 400 S. Monroe St.
A rally at the State Capitol will immediately follow the march. Does anyone know the logistics for this rally? I am coming in from Destin and need to know where to go to park, etc. Overflow parking will be in the City parking lot located at the southeast corner of South Bronough and West Madison Streets. This lot is accessible from South Bronough Street. Bring down; “stand your ground” law! In the name of Jesus. the elephant in the room that no one talks about is that Jeb Bush signed this bill into law when he was told it was poorly written and should be send back to be written over and correctly.But he chose not too because he wanted to curry favor from the tea party,so he signed this poorly written law.This is from a man who wants to be president and claims he is a different kind of Bush.this need to be hung around his neck. Thanks for the info. Re-blogging to help get the word out. I hope it makes an impact without anyone getting hurt.